There is a large amount of confusion, if not bewilderment generated by a long series of marketing attempts in shotgun shells, specifically the pellets contained in the payload. Don't feel bad, I was born a bit confused. At least rumor has it that I was, I don't remember. Although the round ball is not an efficient projectile form, by far the most efficient and consistent shot form is perfectly spherical. This is why wingshooting and claybusting enthusiasts have long sought to start out with close to perfect spheres and have gone to great lengths to keep as many of them as round as possible after their exit from the muzzle. The hundred year search for roundness and consistent size has resulted in carefully sorted and polished shot. A beautiful example is the nickel-plated shot found in some B & P shotshells, like the 12 gauge 1-1/4 oz. #5 MB Long Range shell cut open below, for your viewing pleasure. The pellets themselves glow like little jewels, are beautifully consistent and spherical. It isn't enough to have spherical pellets, but it is a good start. The idea is to keep them consistent in size and shape as much as possible until they reach the target. Lead shot deforms lead shot. The reason for the nickel-plating isn't dashing good looks, it serves as a lubricant to keep the shot pellets from peening each other. Another method is alloying lead with antimony to increase hardness. Hard lead may be equated to stiff jello, but the antimony helps to lessen deformation on initial setback. Yet, it isn't all about density of the material, as antimony is less dense than lead. It is the better retaining of the spherical form factor that makes antimony such an effective addition, not any increased mass of a pellet of a given diameter. The mass, expressed as weight on planet earth due to our familiarity with gravity, actually dips as a lead pellet has higher antimony content. Retained spherical form factor triumphs the lower mass of the pellet quite handily. Though Ed Lowry was no fan of iron (steel) shot, a researcher follows the data wherever it leads. 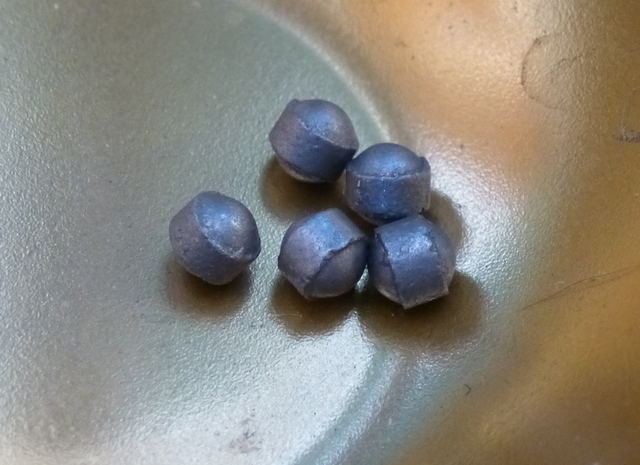 Though steel pellets were clearly inferior to lead, they did better than anticipated. They killed, not well at range, but better than they should have. The reason was the perfectly spherical form factor. In order to have loads equivalent to high-antimony buffered lead performance, three things have to happen. You need a similar launch velocity, though increased launch velocity is a poor return on investment due to the poor ballistics of spheres. 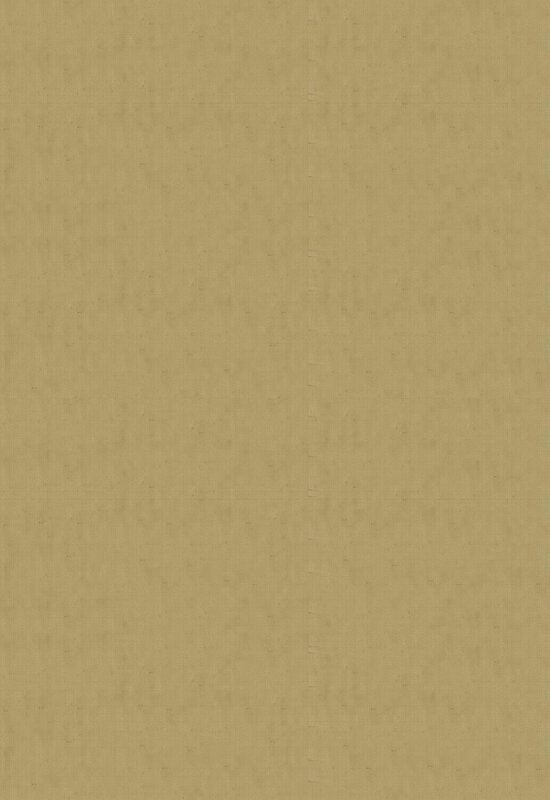 You need a similar material density. Certainly, you can have a steel pellet that weighs just as much as a lead pellet. Putting mass in the air is part of what constitutes a projectile. But when you use low density materials to achieve equivalent mass, the diameter of your sphere rapidly increases. We blow the larger ball with the same mass against air, and more air must be disturbed. The velocity loss of the bloated ball increases commensurately with its increased diameter. Shot density is no goal in itself. The notion is that to find lead-like performance, you need similar pellet diameter and weight along with a spherical profile. Shot numbers actually mean something, although what is sold as both steel and no-tox shot might leave you thinking otherwise. The standard designations for shot sizes in the U.S. are spheres, not any oblong, hex, ringed, or other deformed shapes. Shotshell manufacturers can call them they want, but a shot size is the diameter of a sphere whether they like it or not. If you want the external ballistics of a #4 shot size lead sphere, you need not rely on any guessing or myths as to density. A piece of #4 shot is a sphere .13 inches in diameter. One ounce of shot is 437.499 grains. 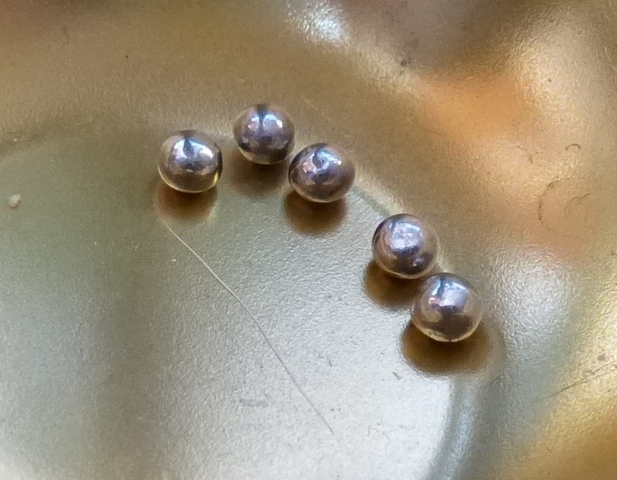 One piece of #4 spherical lead shot is about 3.24 grains, five pieces of #4 lead about 16.2 grains. Whatever the material is, if five .13 diameter spheres of it weighs 16.2 grains, you have the same density as lead. If those five .13 inch diameter spheres weigh more than 16.2 grains, you have a higher density compound than lead. 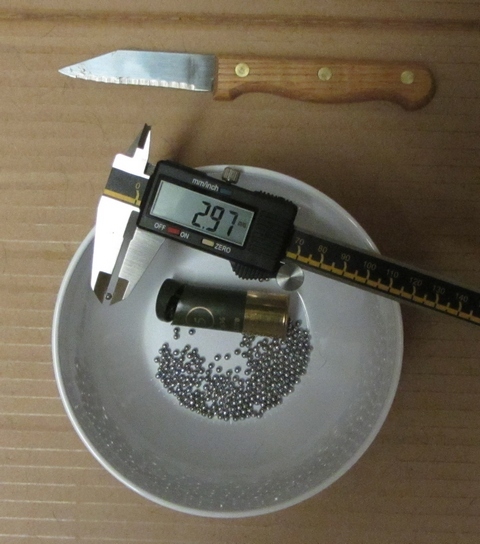 If those five .13 inch spheres weigh less than 16.2 grains, you have a lower density material than lead. It isn't any more complicated than that. Some companies try very hard to make it that way, but it isn't. I'll give you a couple of examples to illustrate. Above is #4 Nice Shot, the barrel-safe lead substitute available as loaded ammunition and as loose shot for the handloader as well. While not "perfectly" spherical, it is very close and very consistent. It mostly retains the very important spherical form factor and patterns very consistently due to its unform and spherical shape. 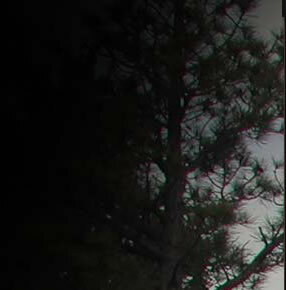 Above is #4 Hevi-Shot Classic Doubles shot, marketed as a lead-only barrel friendly shotshell. Now, exactly how it could be called .13 in. diameter shot is anyone's guess, but that is what it is sold as. It is as far away from a perfectly spherical form factor as you might imagine, and sheds velocity rapidly due to its deformed shape. According to my patterning board, it patterns inconsistently and at a low efficiency. This shouldn't come as any great surprise, as horribly misshapen pellets make weak patterning a virtual certainty. When it comes to competition lead loads, all the major shotshell manufacturers generally do a very good job whether it is STS, Gold Medal, or AA. They are all, generally, contain high-antimony shot. One surprisingly easy way to check lead shot hardness is using variable-tension grippers. I have a set that I use; it looks a lot like needle-nosed pliers. 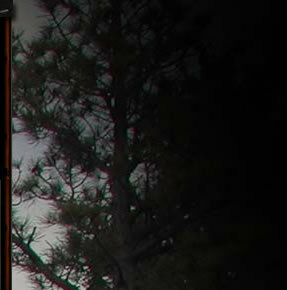 The pattern board gets to decide the specifics of shotshell and choke for you, as always. In the no-tox, lead barrel friendly department there is only one choice widely available as both loaded ammo and a reloading component shot: Nice Shot. For loaded ammunition, Kent Tungsten-Matrix loads have always been superlative and they continue to be. Of the other high density, legitimately denser than lead options, several have either been taken off the market or are now sold as turkey loads alone. The easy pick of that litter, as you can readily tell from several previous articles and big gobblers, is Federal Heavyweight #7: 15 grams per cubic centimeter, one third denser than lead. In the case of Federal Heavyweight, form factor coupled with mass comes into play again. It is the diminutive #7 shot arena form factor that needs to push aside less atmosphere, along with its increased density that allows it to outperform #5 lead with astonishingly dense patterns.